MTP fiber cables and related components are now widely deployed in high speed fiber optic transmission system. MTP cables really provide great performance during 40G and 100G transmission over both short and long transmission distances. But there are so many types of MTP components like MTP cables, MTP cassettes, MTP adapters, MTP patch panels, etc. And all of these products are available in different MTP polarity types. Customers can get confused easily by these MTP products. In addition, unlike traditional duplex transmission on two fibers or BiDi transmission over a single fiber, MTP system transmits optical signal over 12, 24 or more fibers at the same time. More fibers and cables are employed in MTP cabling system. Thus, technicians in data center or server room are still facing a headache problem which is MTP cable management. This post is to offer the details of a commonly used MTP cabling system—12-fiber MTP cable system for better understanding, selecting and management of MTP products. The 12-fiber MTP cabling system is usually used in the following standards: 40GBASE-SR4, 40GBASE-PLRL4, and 40GBASE-PLR4. 40GBASE-SR4 is used for 40G transmission in short distances up to 150 meters over OM4 fibers. 40GBASE-PLRL4 and 40GBASE-PLR4 support transmission distance over single-mode fiber up to 1.4km and 10km separately. These standards use 40G parallel transceivers with 12-fiber MTP interfaces. Except 40G transceivers with 12-fiber MTP interfaces, there is a wide range of 12-fiber MTP connectivity components for transmission. These MTP cabling products cable be used in a lot of applications. 12-Fiber MTP Trunk Cable: MTP trunk cable can be regarded as MTP to MTP fiber patch cable. MTP trunk cable is terminated with MTP connectors on both ends. The MTP connectors can be male (with guide pin on the contact interface) or female (without guide pin). As above mentioned, MTP cables can be divided into different types: Polarity A, Polarity B and Polarity C. A previous of my article “Understanding Polarity in MPO System” has introduced the polarity of MTP components. You can follow this article about the MTP polarity details. The most commonly used MTP trunk cable is a single strand of cable, which can provide duplex 40G transmission at the same time. There are also MTP trunk cables which are composed by several strands of cables. 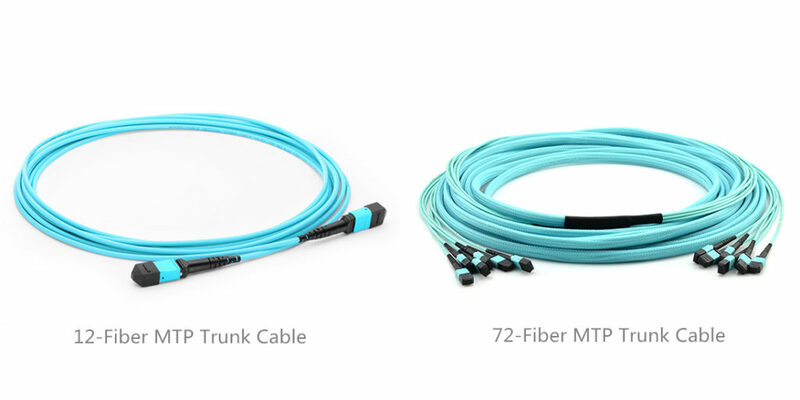 Take the example of 12-fiber MTP trunk cables as shown in the following picture. On the left of this picture, there is a 12-fiber MTP trunk cable which is a single strand cable. On the right of this picture, there is a 72-fiber MTP trunk cable which is composed by 6 strands of 12-fiber MTP trunk cable. 12-Fiber MTP Harness Cable: MTP harness cable is a length of fanout cable with one end terminated with MTP connector and the other end terminated with several connectors like LC and SC. 12-fiber MTP harness cables also come in a variety of types according to fiber type, polarity type and connector types. The following picture shows a most commonly used MTP-4 duplex LC fiber cable. 12-Fiber MTP Cassette: MTP cassette is like MTP harness cable which also provides the transferring between MTP interface and LC or SC interfaces. But MTP cassette can protect the fragile optical fibers inside the metal box, and has lower space requirements than MTP harness cable. The following picture shows a 12-fiber MTP-LC Cassette. The 12-Fiber MTP fiber optic products can be used in many situations not only for 40G fiber network. 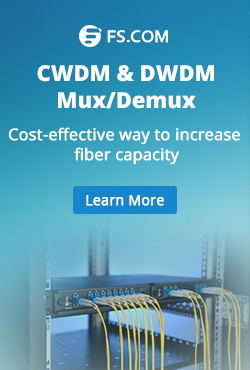 The following introduces several typical fiber cabling solutions using 12-fiber MTP products. The following picture shows the wire guide for 10G to 10G connections using OM3 12-fiber MTP fiber cables and 12-fiber MTP-LC cassettes. A 10G link just uses two of the 12 fibers. 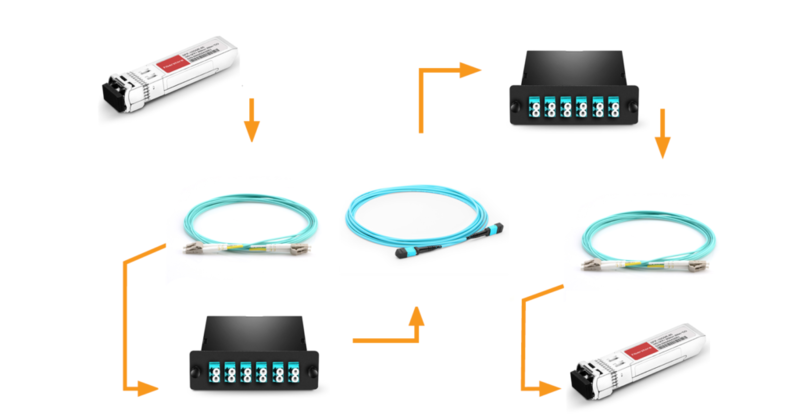 On each end of this link, up to six 10GBASE-SR SFP+ modules can be connected to the fiber optic network, which means up to 60G can be transmitted by the following 12-fiber MTP system. For 40G to 40G transmission, MTP trunk cable is usually being used. The following picture shows the connection of two brocade ICX 7750 switches over long transmission distance. Brocade compatible QSFP-PLR4-40G transceivers are being used on both ends of this 40G fiber link. 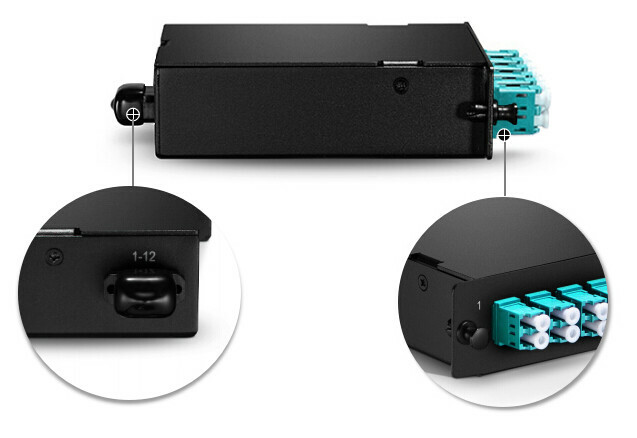 12-fiber MTP OS2 trunk cable is being used to connect the QSFP+ modules on each end. Sometime the 40G device is still required to be connected with 10G devices. Here takes the example of connection between 40G QSFP+ port on Brocade 7750 and 10G SFP+ port on Brocade Fastlron FCX6245 over long transmission distances. 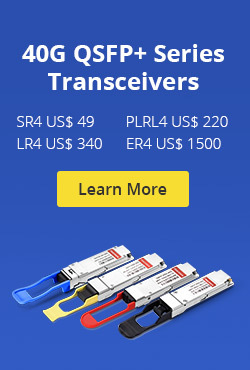 To distribute the 40G signals into four 10G, Brocade compatible QSFP-PLR4-40G transceiver, and Brocade compatible 10G-LR SFP+ transceiver, 12-fiber MTP-LC cassette, 12-fiber MTP trunk cable and four LC-LC duplex single-mode fiber patch cables are used. The MTP cassette transmitting the MTP interface to the LC interfaces as shown in the following picture. 12-fiber MTP cabling system is a cost-effective and space saving solution for both 10G and 40G transmission. As most of the MTP fiber products are factory pre-terminated, these products can provide fast installation and great network performance. FS.COM provides full range of MTP fiber optic products. You can visit FS.COM or contact sales@fs.com for more details about MTP fiber cabling. This entry was posted in Fiber Cabling, Fiber Patch Cable, How To, MPO Assemblies, Network Solutions and tagged 12-fiber MTP cable, 12-fiber MTP cabling, MTP polarity, MTP trunk cable, QSFP-PLR4-40G on November 1, 2016 by Alice Gui.